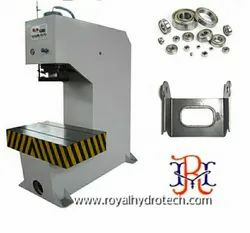 Offering you a complete choice of products which include c-type hydraulic bending press. 1.Working pressure and slide stroke can be adjusted . 2.Overload overflow protection is outfitted to hydraulic system, can assure no leakage,and the oil level can be read or seen directly. 4. Hydraulic support insurance circuit to prevent go down of slide out of control. 5. It is convenient to clean and change oil.